The moniker, ‘roof of the world’, is apt for Tibet in many ways. Not only does the region stand amidst the Himalayas, but also has an otherworldly simplistic charm that is bound to enthrall the traveller. For this, one should make a trip to Tibet. Affixed in a time-warp, Tibet is a window to how the world looked many centuries ago, unaffected by western influences, content and wonderfully aloof from the rest of the world. It is a treasure trove of nature and Buddhist history and the original home to Dalai Lama, before he was exiled to India. A spiritual vibe hangs thickly in the air in Tibet. 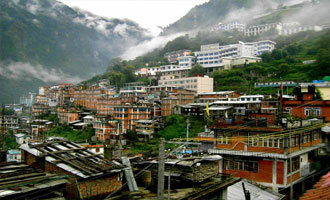 This, and the company of the Himalayas are compelling reasons for travellers to go here. Tibet knows only different degrees of cold. While it’s cool in summer, the weather is excruciatingly cold in the winters. It’s only in the thick of summer when the lower lying regions get some relief to thaw themselves from the cold to the bone weather from the rest of the year. Since this is a high altitude plateau, encircled by towering mountains, there is little rain in the actual habitated places of Tibet. An arid, cold desert aura accompanies all parts of the region. This insipid looking topography throws up fantastic vistas. When speaking of Tibet, Lhasa is the one name that travellers identify with immediately. The ancient city is the prominent junction for a traveller. Showcasing its 1400 years old history, Tibet is a proud symbol of freedom, ever since Tibet was declared an autonomous region of China. Lhasa, as a capital of this region is the most eminent gateway into Tibet. It is home to the Potala Palace and Norbunglinka, structures that commemorate the Dalai Lamas as their living quarters and summer palace, respectively. 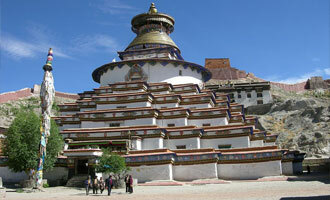 The other important cities include, Gyantse, Shigatse and Qamdo. 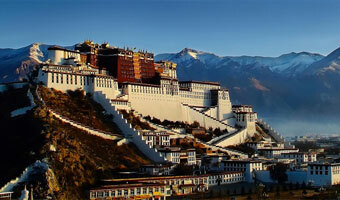 An enchanting city, Lhasa literally means, ‘Place of Gods’. The white lego like houses and structures sprawl around the magnificent Potala Palace. With its narrow alleys, old world vintage ambience and a soothing vibe, there is no way that one cannot fall in love with Lhasa. Encircled by blue mountains, the city is nothing short of paradisiacal. 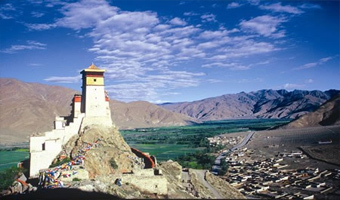 Located in the Yarlung Valley, 183km from Lhasa, the city is steeped in antiquity. 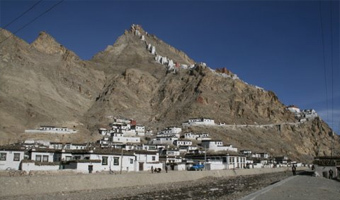 The highlight of the town is the 14th century monastery of Ganden Chökhorling that was destroyed several times before standing resplendently after having been restored. Tsedang can safely be called the land of legends – there are plenty of stories embedded in the culture of this small town. 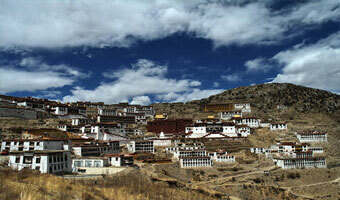 A fairly large city in the historical province of Tsang, Shigatse should be on the travellers list for many reasons. 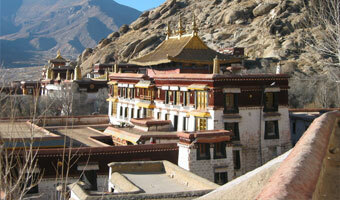 The top most reason has to be the Tashilhunpo monastery. After this is the Summer Palace of the Panchen Lamas. 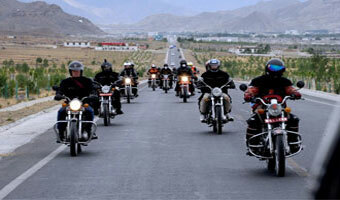 The experience of Shigatse is an interesting mix of history and modern culture. Located on the ancient trade route, Gyantse still retains its original importance on the map of Tibet. It lies in the Nyang Chu Valley. A 14th century fortress and ruins of a wall that encircled the city are the highlight here. Palcho monastery, the largest Chorten in Tibet is located here. Shegar boasts of an extraordinary sight of the Crystal Fort, whose wall snakes up a steep mountain. Only the intrepid make the journey on top of the fort, but if one does, he is rewarded with the view of Mount. Everest on a clear day – that makes all the effort worth it. Despite the fort being its only highlight, Shegar should be on the list for travellers. A town that straddles the border and therefore the culture of Nepal and Tibet is an interesting addition to your travel to Tibet. Relatively low in elevation, the town offers views that are unique from the rest of arid Tibet topography. Here you can see dense forests, sprawling vegetation and waterfalls swollen by the melting snow of the Himalayas. 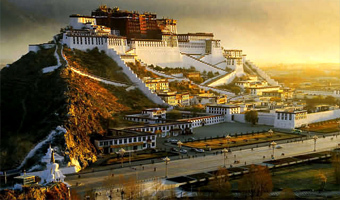 Apart from the mighty Mount Everest, in whose shadow the region stands, iconic places of Tibet include all the structures that are embedded in history for their association with the Dalai Lama – namely, Norbunglinka and Potala Palace. The Jokhang Temple, Yamdrok, Barkhor Street and the Tashi Lhunpo Monastery are other structures that resonate the history and living culture of the people of Tibet. 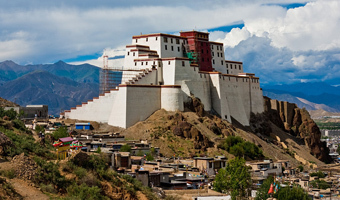 A World Heritage Site, the Potala Palace was once the abode of Dalai Lama, till the 14th Dalai Lama was exiled to India. It now serves as a museum and a veritable symbol of commemoration to the Buddhists and their freedom. 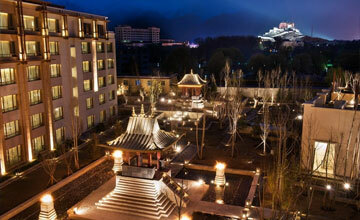 The palace stands on an elevation of 3700 m, magnificently overlooking the city of Lhasa. Sera means "hailstone" in Tibetan. Set at the foot of the Wudu Hill to the north of Lhasa City, Sera is comprised of a great sutra chanting hall and a college. 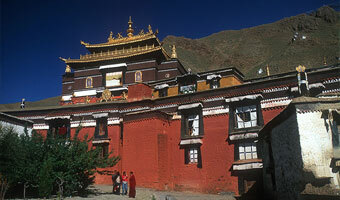 Sera Monastery was founded in 1419 by Jamchen Choje, a disciple of Tsongkapa, the founder of Gelugpa Sect. The monastery was erected on a mountain slope. Sera Monastery together with Ganden Monastery and Drepung Monastery in Lhasa are known as the Three Great Monasteries of Tibet. Situated at the foot of the Mountain Gambo Utse, the Drepung Monastery is known as the most important monastery of Gelugpa Sect in Tibetan Buddhism. 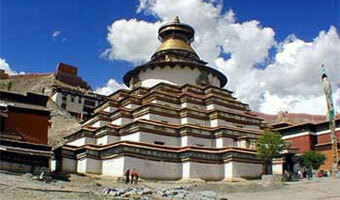 It was founded in 1416 by Jamyang Choje, a disciple of Tsongkhapa, the founder of Gelugpa sect in Tibet. Covering an area of 250,000 square meters (299,007 square yards), it held 7,700 in its heyday, and is among the largest monastery. Resembling a heap of rice from a distance, it was given the name 'Drepung‘, which, in the Tibetan language, means 'Collecting Rice’. 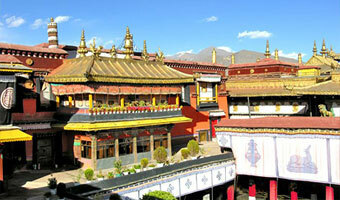 One of the most sacred sites for Buddhists in Tibet, the Jokhang monastery is also known as Qoikang Monastery. A wonderful blend of Indian, Nepalese and Tibetan style of architecture makes Jokhang a unique architectural delight. Wondrous legends surround the temple, adding a dash of enigma to the already intriguing structure. Both historic and a structure of modern importance, Norbulingka served as the traditional summer residence of all Dalai Lamas from the 1780s until the 14th Dalai Lama's exile to India in mid 20th century. This has been declared a World Heritage site. 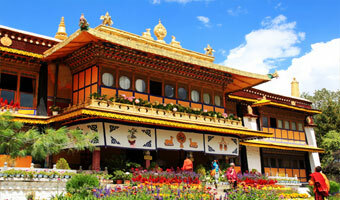 Traditional aesthetics of the park are maintained at this largest park of Tibet, with sprawling well-manicured lawns. The annual Sho Dun or 'Yoghurt Festival' is held here. Located in Gyantse and founded jointly by Kedup Je of the Gelugpa Sect and Rabten Kunsang of the Sakyapa Sect in 1418, the Phalkor Monastery has a special influence over Tibet's Buddhism owing to its unification of three different sects, the Gelugpa, the Sakyapa and Bhuton Sects, in a single monastery. The famous Kumbum pagoda, built in collaboration with Newari artists from Nepal & Tibetan artists, also stands in the same courtyard with nine storeys, 108 doors and 77 chapels containing clay sculptures and various murals. The pagoda is said to have 100,000 images, either sculptured or painted, this is the reason for its name "100,000 Image Pagoda". 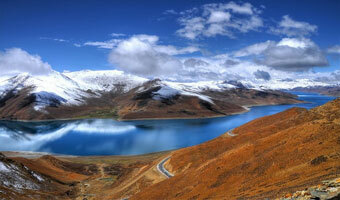 Yamadroke Lake is one of the biggest and beautiful lakes in Tibet. One can pass by this lake with about 02 hours drive along its bank. Yamadroke means turquoise in Tibetan language. In fact, the lake looks exactly as beautiful as turquoise blue during the good weather days. 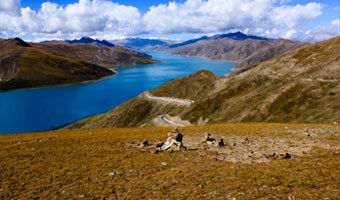 This freshwater lake, unlike other Tibetan lakes, is sweet and non-saline, extending for 624 sq. km., in the shape of two pincers of a large scorpion. You can have a short stop on its bank and enjoy photography here. Namtso in Tibetan means ‘Heavenly Lake’, is often described as being next to heaven because of its lofty altitude, stunning beauty, pure blue water, and spiritual associations. It is the highest saltwater lake in the world. Snow-capped mountains and open grassland, dotted with yak herds and local nomads, surround the crystal clear water of Lake Nam, making it one of the most beautiful places in Tibet. Ganden Monastery is the 1st and primary monastery of the Gelugpa sect in Tibetan Buddhism. It was founded in 1409 by Tsongkhapa, revered reformer of the Gelugpa or Yellow Sect of Tibetan Buddhism. As Tsongkhapa himself initiated the Ganden Monastery, also acted as its 1st abbot and passed away in the monastery. Along with Sera Monastery and Drepung Monastery, Ganden Monastery is also known as the Three Great Monasteries of Tibet. 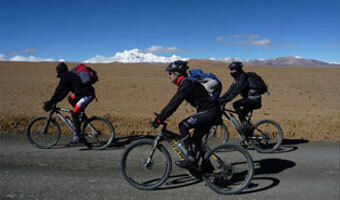 The rugged terrain of Tibet is ideal for adventure lovers. It is no wonder that biking enthusiasts and motorcyclists find this region exceptionally great to discover. Apart from that, the Mt. Kailash trek is another charm for those who love the outdoors. High mountain passes, villages balancing on the steep hillsides and trekking routes that promise to enthrall make Tibet one of the most coveted destinations for outdoor enthusiasts. The Tibet landscape offers inimitable sights and challenges that one would recall with excitement throughout their life. You are literally riding on the roof of the world in the company of the Himalayas, clear blue skies, and going past villages that are a window into the heritage and local life of Tibet. This one is worth learning motorcycling for. Those looking for an extraordinary adventure in the midst of one of the most spectacular topographies, should sign up for a mountain biking tour. This comes with instructors, equipment and even a back-up van for safety. For the active traveller, there is no better way of experiencing the countryside. Tibet, land of spirit and dream, is always mysterious to trekkers. Lying in the shadow of Himalayas, the breathtaking high plateau landscape of Tibet offers great opportunities for trekkers. No matter what your interest is, climbing majestic towering mountains, circling around holy lakes, visiting sacred monasteries, riding horses across the vast grasslands, or hiking through national parks, Tibet has something for you. It is imperative to understand the rhythm of a region before you dive into sightseeing and enjoying the topography of a place. The best way to immerse and orient completely is by spending some time in a local home. Indo Asia’s resilient bonds in the region allows for clients to spend a day at a local home, eating food from its kitchen and getting entertained with a cultural show. Insights and explanations are close at hand, and that’s what makes all the difference. Most of the festivals in Tibet are celebrated in the Buddist monasteries of the towns, which are the cynosure of prayer, commemoration and celebrations. The Saga Dawa, The Monlam Prayer Festival, The Butterlamp Festival and The Thangka Unveiling at Tashilhunpo are some of the most important occasions for the locals. Festivities are low-key and do not have a raucous vibe – much in tune with how the whole region is even otherwise. But do expect to see a lot of colour, local food and dances. The Tibetan name for New Year is known as Losar, and is celebrated across Tibet with a special flavour of zeal and reverence. The region comes alive with dance, music, festivities and religious activities for 15 days. 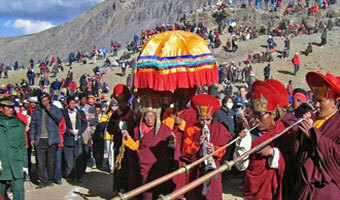 The monasteries are the cynosure of all activities, as people dress in traditional clothes and offer prayers. The monastery courtyards come alive with performances by the monks. The festival, Saga Dawa, commemorates the life and teachings of Buddha and is celebrated across the region with much fervour. 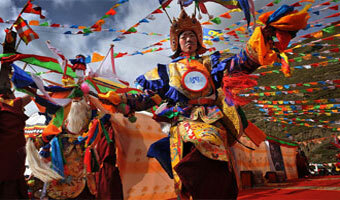 Celebrated in the period of March- April, it is a time for Tibetan cities to shine. Trips to the monasteries, religious processions, traditional dressing and great reverence for the teacher are observed on this day. 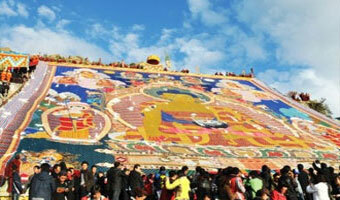 Commonly known as the ‘yoghurt’ festival, Sho Dun has a permanent place on the annual festival calendar of Norbunlingka. The origin of this summer festival can be traced to 16th century, when the local people arranged a banquet for the monks, and the chief dish of the event was yoghurt. 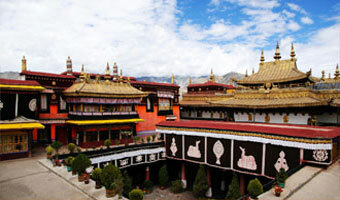 Go here to see the colourful operas that are performed which will transport you into the history of Tibet. Though there aren’t too many options of accommodations in the country, a handful that are present are delightful. Local architectural and design nuances can be seen in most of them, which is a great orientation to the culture for the travellers. Tibetans are proud of their heritage and use these aesthetics in many aspects. Reasonably good standard hotels are found only in Lhasa, the capital town of the region while at rest of the places the lodging gets more rudimentary. 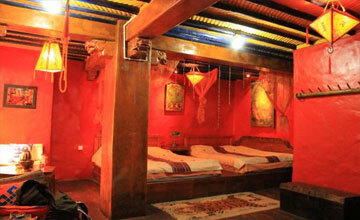 House of Shambala takes you to a bygone era and looks nothing less than a set of a period movie. The 9 roomed property ensures that the experience is truly boutique, with every aspect of the stay customised to your liking. 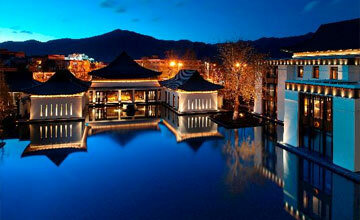 The tented terrace teahouse is where most guests choose to unwind, with the city of Lhasa sprawled before them. Unarguably one of the best places to stay in Lhasa, Shangri La stays true to its name by offering a superior experience and is an epitome of elegance. The view of the mighty Himalayas and the magnificent Potala Palace in their shadow can be enjoyed from most of the rooms. 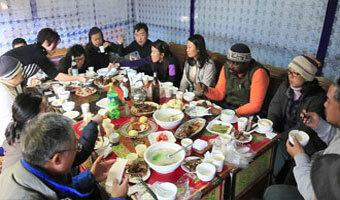 Add to that, the local dining experience and sightseeing insights, and the trip is a wholesome one. The amenities and facilities of the hotel are akin to any 5 star accommodation across the world.